Discovery World is Milwaukee’s premier, non-profit science and technology center for the whole family. Our 120,000 sq. 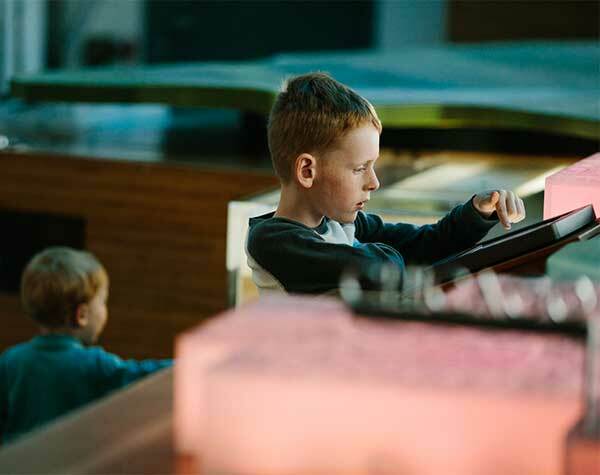 ft. center offers fun and educational experiences and features interactive exhibits, the Reiman Aquarium, educational labs and programs, and other exciting activities. Our unique, hands-on exhibits and programs focus on two areas – technology and freshwater sciences. We have eight learning labs that alone comprise of more than 10,000 sq. ft. of space! We also offer our award-winning Summer Camp, Boy Scout and Girl Scout programs, community partnership programs, and learning experiences aboard Discovery World’s tall ship (and Wisconsin’s Flagship) the Sailing Vessel (S/V) Denis Sullivan. We want to light the spark of curiosity in your kids. We want to inspire them to become the next generation of engineers, designers, scientists, innovators, community leaders, and makers. We want you and your family to explore, learn, create, and have fun. Discovery World is a 501(c)(3) nonprofit organization. Your gift is tax-deductible to the fullest extent of the law. Back in the very early 1980s, a Milwaukee patent attorney named Bob Harland had an idea. As someone who worked with inventors and new inventions for a living, Bob knew that the kind of people who were quietly building the future were tinkerers – people who liked to experiment with technology and make new things. He realized that the world would be a much better place and the future would be a whole lot brighter if there were a lot more inventors and innovators. Bob figured that the best way to help young people become inventors was to create a place where they could get their hands on science and technology. But it wasn’t enough to learn how to make things. Bob understood that if an invention was going to have any kind of impact at all, then it had to find its way to the marketplace. In other words, he wanted young people to learn how to become entrepreneurs. So Bob Harland, along with his friends Andrew “Tiny” Rader, William Brady, Fred Stratton, Igor Kamlukin, and Carl Moebus, started Discovery World in 1983. Our first home was in the basement of a Boys & Girls Club just off Brady Street on the East Side of Milwaukee. Soon after that, we moved inside the central branch of the Milwaukee Public Library. Then Bob Harland and Andrew Rader invited Michael Cudahy, local philanthropist and co-founder of Marquette Electronics, to join the board. Mike was a relentless tinkerer and a brilliant entrepreneur, and he understood Discovery World’s mission almost better than anyone. Mike gave the organization new energy and a new home. In 1995, we moved to 815 N. James Lovell Avenue and shared a building with the Milwaukee Public Museum. In 2006, we moved again, this time to our beautiful space on the shore of Lake Michigan. Today we have new community partners like Rockwell Automation and Johnson Controls, MilliporeSigma, the Reiman Family Foundation, the Greater Milwaukee Foundation, the Helen Bader Foundation, the Fund for Lake Michigan, Kohl’s Cares, PPG, HUSCO International, and many others who believe, like Bob Harland, that the way to a better future is through science, technology, engineering, and mathematics.